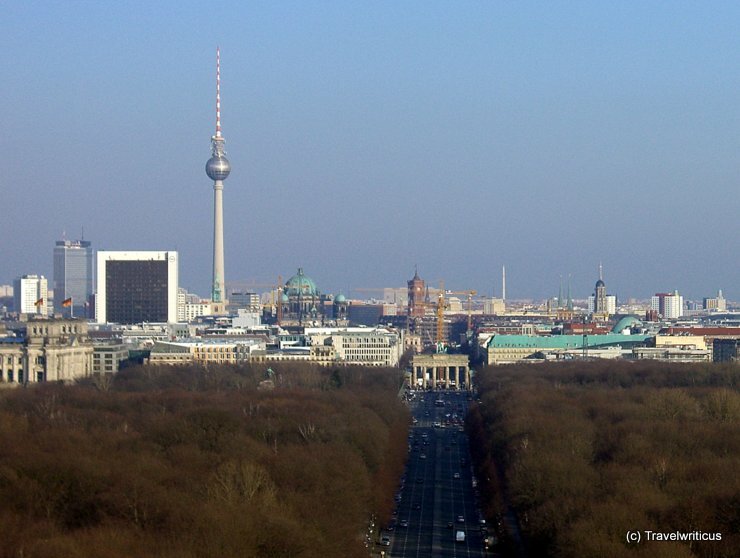 The skyline of Berlin as seen from the top of the Victory Column (Siegessäule). On the left side you can see the television tower (Fernsehturm) of Berlin. The white cross at the sphere is often called ‘The Pope’s Revenge’. This joke refers to the fact, that the administration of the former German Democratic Republic was known for their antireligious attitude. They were probably not amused by the fact, that everybody in Berlin could see a white cross in the sphere. Actually the cross is just a sun reflection evoked by the construction of the sphere. This entry was posted in Skylines and tagged Berlin, Germany by Travelwriticus. Bookmark the permalink.